Learn more about our family and the founding of BFF! The first team going to India leaves on September 7th. That is two weeks from tomorrow! Time moves along unbelievably fast. Keng will accompany Paul on this first mission. Our messages will be on discipleship training. Our first stop will be close to the Himalayas west of Nepal with a smaller group of individuals preparing for ministry. 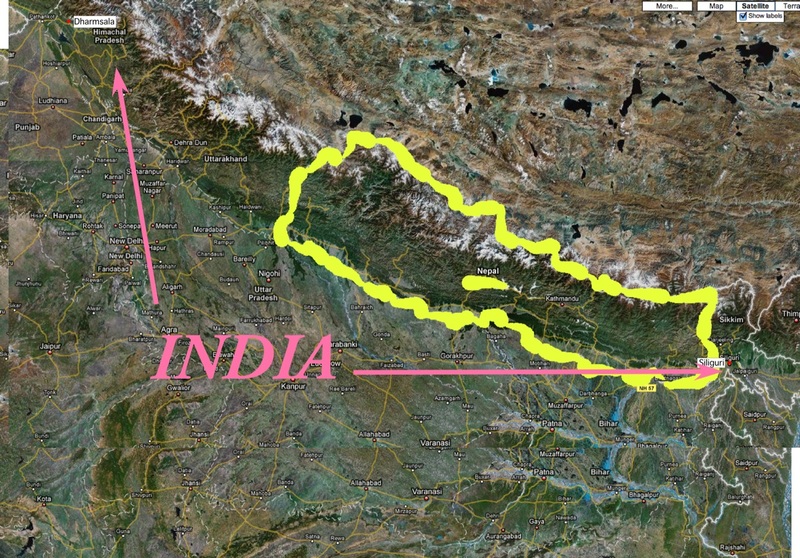 The second stop will be a large group of pastors east of Nepal (inside yellow). Click for larger picture. The trip will be demanding. Please do pray as we coordinate our messages. The second mission team to southern India will be departing mid-September. They will be involved in church work, student ministry and tribal work. There is so much need for evangelism and instruction there. $2,300 has been given. A large sum is still needed. Please pray and give as the Lord leads. We are excited to report to you that BFF is on the way to reaching our goal of 1.5 million page views this year. So far from January to June we had over 85,000 page views, averaging about 14,000 each month. These are not just hits but visited web pages. Hits are usually about 5 times more. We are working on producing higher quality materials as well as trying to be more aggressive in the distribution of BFF training material. I hope to share more about this soon. We have asked you to join us in prayer for a mansion for a training institute. The reason a mansion came to my mind is that we could arrange for close living quarters with our family and further the quality of the training. I am not opposed to other situations but look to the Lord for guidance and provision. As I was reflecting on our mission statement this week, I got two calls. One was from a pastor in Philadelphia who plans to use BFF training material for a discipleship training school that he has a burden to start in his church. He mentioned the great need for such training. Another was from an elder in a Canadian church. He shared with me his great burden on how to sustain a work that God has started. BFF discipleship training materials wonderfully met the need. These calls reminded me that God is preparing us to develop a place where people like these could fly in for a shorter time period and gain special training. Keep praying with us. They are building a 750 million dollar casino close to our home. It is easy for the Lord to raise a few million for His work. The North India team travel details are settled. Praise God for the $2,300 that has come in for the STM. Sermon on August 17th was used of the Lord. Rough plans for the South India STM team are worked out. I have learned so many web design lessons to help better distribute web materials. Linda has regained much of her strength and is almost ready for homeschool starting Monday August 25th. Praise the Lord someone donated a new laptop for Pastor J. our coordinator for the pastors in India (his motherboard broke down). Pray for the various people Paul mentors regarding full-time ministry and other matters. That God will prepare the hearts of those receiving the teaching from our STM teams. India STM still needs about $10,000 for the full team. Pray that $5,000. comes in by September 7th. Pray for God's provision for a BFF training institute. Paul is designing a Level 2 discipleship class with Pastor Ed. That homeschool and children's ministry goes smoothly for Linda especially when Paul is gone.